Lochwood Tower (or Lockwood Castle), the seat of the Johnstone Clan, lies a few miles southwest of Moffat in Dumfriesshire, Scotland. 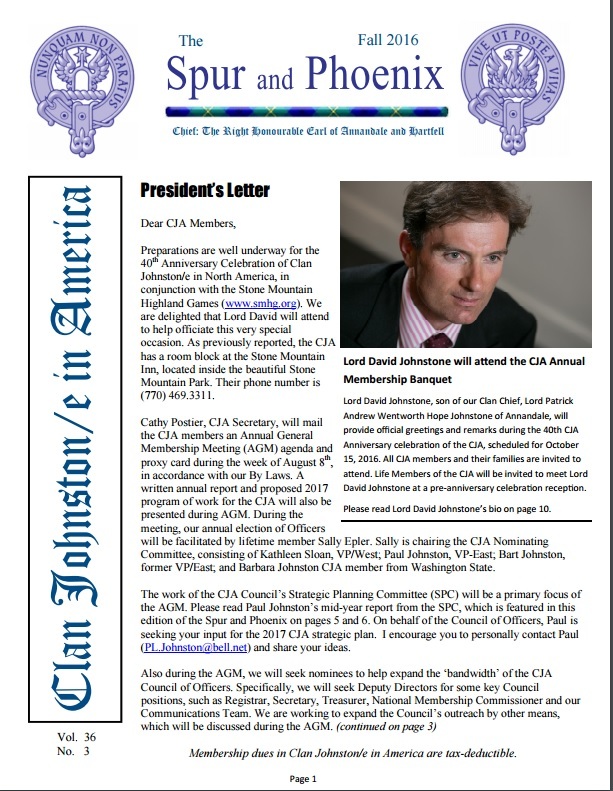 It is located in upper Annandale,the valley of the Annan River, which originates in the Devil’s Beef Tub north of Moffat and flows south some thirty miles to the Solway Firth near Annan. 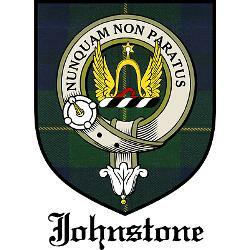 Lochwood is situated in the Parish of Johnstone, which takes its name from (or gave its name to) Lochwood’s owners. 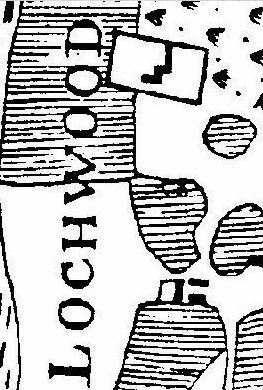 The name “Lochwood” is derived from a forest (wood) near an ancient lake (loch), which later became a bog known as Lochwood Moss. Parts of the forest still exist in the form of thousand-year-old oak trees (the”Royal Oaks”) which grow adjacent to the Lochwood Tower site. Click here for a map showing the location of Lochwood. NOTE: As of November 2002, Lochwood has been fenced off for reasons relating to public liability. Although the ruins are visible from the road it is not possible to go into the ruins, which are subject to falling rocks and possible collapse. Below is a portion of a map of the Lochwood site from 1785, made when the neighboring farms were being created in connection with the agricultural revolution. This map was also furnished by Mr. Maxwell-Irving, and is rotated so that north is the top of the picture. 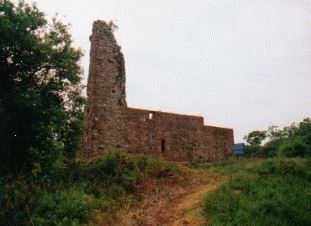 The ruins of the castle are inside a rectangular enclosure. 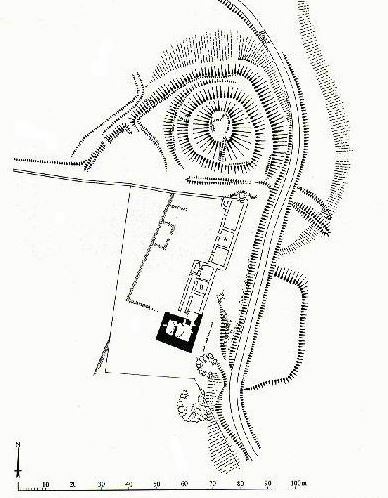 Note that the outline of the east range of buildings was very prominent in 1785. During the 1980s, the present Chief of the Johnstones, the Earl of Annandale and Hartfell, cleared away the rubble caused by the collapsing tower, restored the two-chambered vaulted basement (one of which chambers was the dungeon), and cemented the remaining walls firmly in place. At this time he found various artifacts, including the original iron yett (gate) to Lochwood. Only part of the first story remains, but the layout of the site has been preserved. There is only one known comtemporary drawing of the castle while it was inhabited. This is a rough, thumbnail sketch of Lochwood from the south, or tower end, on an English military map of 1547 called the Platte of Castlemilk. The sketch on the map is labeled “loithwood the lardjohnestoun.” A detail from the map is shown below. The walls of these fortresses were of an immense thickness, and they could easily be defended against any small force; more especially, as the rooms being vaulted, each storyformed a separate lodgement capable of being held out for a considerable time.